Read more about these blinkies by clicking here. 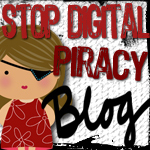 "Stop Piracy" is a sub-blog of Jen Strange's "Digi-Scrappin' with Jen." The primary author is Jen Strange, and the blog was Meredith Fenwick's idea. Banner and navigation buttons created by Meredith Fenwick. Avitar in banner by Mindy Terasawa . All content, aside from quotes from other sources, (C) by each author, 2005, 2006, 2007. Please e-mail jenstrange AT gmail DOT com for permissions. Just becuase it was free, doesn't mean you can do anything you want with it. To learn more about freebies and piracy, please read Why it's not ok to share freebies . Blinkie by Jen, elements by Carrie Stephens. ~ Why it's not ok to share freebies. ~ Help us with Piracy Reporting! ~ 10 Big Myths about Copyright, explained. Comments are moderated, they won't show up until I review them first -- I will approve the appropriate comments for posting, and if you leave me a valid e-mail address I can talk with you in e-mail about the others. If you have a comment you'd like me to see, please e-mail me at jenstrange AT gmail DOT com. click here for your choice of banners and graphics to use to link to this site!! !